PHUKET: Swedish toddler Hannes Bergstrom, just 20 months old, early this afternoon was reunited with his uncle, Kim Kärkkainen, and grandmother Raija Kärkkainen. 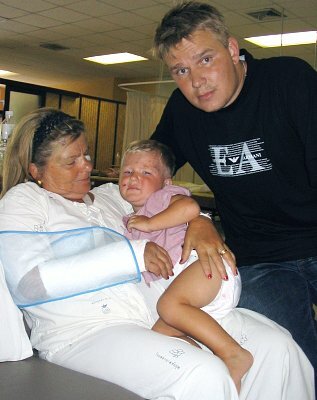 Hannes was separated from his parents when he was rescued at Bang Niang Beach, Khao Lak, where the family were staying, and brought to Phuket International Hospital. Family members in Finland saw the photograph of young Hannes on the Phuket Gazette website and contacted the boy’s uncle Kim, in Pattaya within an hour of the story going online. Mr Kärkkäinen told the Gazette that although Hannes’ father, Marko Bergstrom, and grandfather Asko are recovering in hospital, no trace has as yet been found of the boy’s mother, Susanne.